Whoever considers the great height of dignity and glory to which God has raised the Most August Virgin Mary, will easily perceive how important it is, both for public and for private benefit, that devotion to her should be assiduously practiced, and daily promoted more and more. 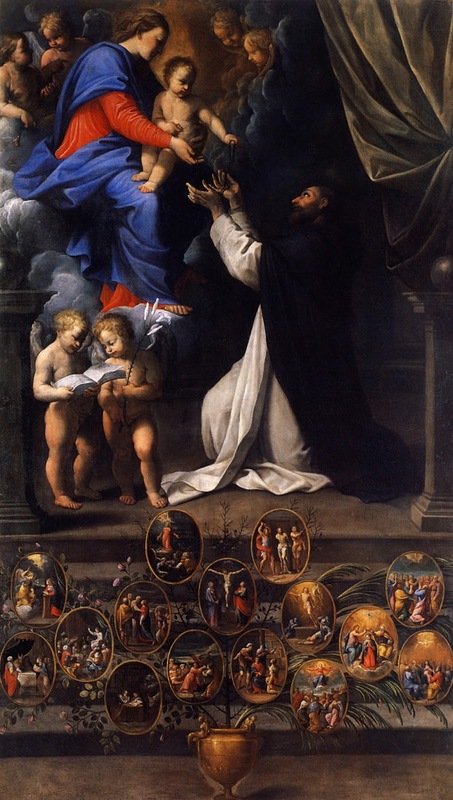 So far from this derogating in any way from the honour due to God, as though it indicated that we placed greater confidence in Mary’s patronage than in God’s power, it is rather this which especially moves God, and wins His mercy for us. We are taught by the Catholic faith that we may pray not only to God himself, but also to the Blessed in heaven (Conc. Trid. Sess. xxv. ), though in different manner; because we ask from God as from the Source of all good, but from the Saints as from intercessors. “Prayer,” says St. Thomas, “is offered to a person in two ways – one as though to be granted by himself; another, as to be obtained through him. In the first way we pray to God alone, because all our prayers ought to be directed to obtaining grace and glory, which God alone gives, according to those words of Psalm 83, 12, “The Lord will give grace and glory.” But in the second way we pray to holy angels and men, not that God may learn our petition through them, but that by their prayers and merits our prayers may be efficacious. Wherefore, it is said in the Apocalypse (8, 4), “The smoke of the incense of the prayers of the Saints ascended up before God from the hand of the angel.” (Summa Theol. 2a 2ae, q. 83. a. 4. ).